The Bourgeois Country Boy Deluxe Guitar. When Bryan Sutton, the new hotshot guitar whiz for Ricky Skaggs' Kentucky Thunder joined the band, he needed an upgrade to an instrument that was as amazing as he was. He needed the kind of guitar that was fitting for one of the best guitarist in the world in one of the most talented ensembles in the world. He got exactly what he wanted and needed via Dana Bourgeois' Country Boy Deluxe Guitar. Listen, I've owned a few outstanding Martin instruments, and my Santa Cruz Dreadnought is the match of any guitar in the world of that style, but I've also played some Bourgeois guitars in guitar shops, and OH MY!!!!! Those things are virtual SOUND CANNONS. Besides all of that, these Country Boy Deluxe guitars by Bourgeois are also beyond beautiful. That is Gold, of course, so you get the idea that we aren't talking cheap or inexpensive here - what we are talking about is WORLD CLASS. That is some of the world's finest solid mahogany - the kind of wood that makes notes JUMP from an instrument into your ears!!! Check one of these out today! The RainSong Dreadnought Guitar - Carbon Fiber and Graphite Indestructibility. If you are like me, then you treasure your acoustic guitars. Look, it doesn't matter whether I've even played one of them in years, all that matters is that I know that my precious wood and steel babies are there for me, and healthy. Seriously, a professional quality acoustic guitar is no cheap thing, and it's not inexpensive either. Those guitars cost money, and there are a ton of people just like me that are not professional guitarist, but still have them, still cherish them, and still worry about them. An Expensive acoustic guitar is an heirloom item that can be passed down from generation to generation - but a lot of them don't make it. They are only made of wood and steel. How many guitars are destroyed in auto accidents, or by storms, tornadoes, heat, and cold, or flood? We'll never know, but we do have a solution, and here it is! RainSong! The first guitar company that brought carbon fiber and graphite guitars to the world. They are virtually indestructible, and built to last forever! The Legendary Earl Scruggs, and The Beauty of Bluegrass and Banjo. Earl Scruggs is an amazing American Musical Legend the likes of which you can still see perform, as he is still living. He has few contemporaries that have lived and performed as long as he has, and there are few living legends that play the banjo. It's not that the banjo is without it's virtuoso players, oh no, not at all. The problem is that the United States Media, the fourth and unofficial wing of our government, the one that deals with propaganda, doesn't want you listening to honest music forms that do not promote lasciviousness and materialism. Earl Scruggs is one of the coolest American musicians that has ever lived. If you don't know about him, then please read on! Not only is Earl Scruggs an American Musical hero, he's spawned a family full of similar Scruggs musicians. We're talking about a man, after all, who has entire musical styles, and products named after him. Born on the sixth day of January, in the year of our Lord 1924; in the town of Flint Hill, North Carolina to Georgia Lula Ruppe and George Elam Scruggs. 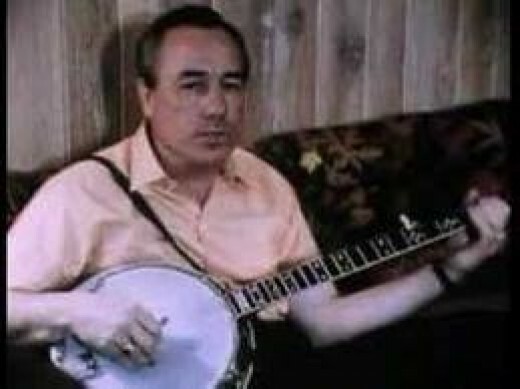 Earl Eugene Scruggs perfected and performs a three finger style of banjo playing rightly called "Scruggs Style" playing, and this is done on the five stringed banjo. This style of banjo playing is a defining and founding characteristic intrinsic in America's native musical art form called Bluegrass. Although other musicians had played in 3-finger style before him, Scruggs shot to prominence when he was hired by Bill Monroe to fill the banjo slot in the "Blue Grass Boys". Scruggs built on earlier styles to develop a truly new and readily identifiable style, involving: unprecedented smoothness, syncopation, and uninterrupted flow; a large vocabulary of unique and original licks; blues and jazz phrases, evident in backup and in solos such as "Foggy Mountain Special ;" and an overall coherency and polish that other stylists lacked, which inspired imitation by newer generations of banjo pickers. Another of the huge bits of fallout that has come with the desecration of American Music, and American culture via the mainstream mass media that is completely under the control and monopolized by an ethnic coterie of internationalists, is that today, a great musician such as Earl Scruggs, is most widely known for a composition that he hated, "The Ballad Of Jed Clampett, " from the television show, "The Beverly Hillbillies ." The two most defining members of the American Music form known as Bluegrass are Bill Monroe, and Earl Scruggs, as each had achieved virtuoso level musicianship on somewhat obscure instruments in a style that is uniquely American, while at the same time echoing styles distant both in origin and time, and mostly derived from Celtic music. Earl Scruggs three finger banjo style is a vastly more complex version of something that had been played in the United States since the early 1800's, and when he combined his instrumentation with the rhythm guitar and vocals of Lester Flatt, then he became prominent throughout the South, and the entire world in the realm of the style of music that Bill Monroe is often considered the father of, Bluegrass. This is a top notch bio for the careers of Lester Flatt and Earl Scruggs. Earl Scruggs, legendary American musician is still with us, my friends, and he's also got some very talented children, Randy Scruggs especially comes to mind, but then again, I'm a guitar nut. Earl's finest hours, musically, and in my opinion, are all featured on albums by the Nitty Gritty Dirt Band, and all three of their Will The Circle Be Unbroken albums, volumes I,II, and III. Earl had recorded with them as late as 2003. I do not know if Earl is still touring or recording, but he's still very much alive; and if you hear of him being on stage somewhere, then I highly recommend that you take the opportunity to go and see this fine American Musical Legend. Buy Earl Scruggs Music on amazon.com! !